In this water have holy hands baptized. In this water, holy people, both known and unknown, have been confirmed in the faith. With this water, the holy Nikephoros of Chios was anointed in fear. Of this water, Makarios of Corinth partook with reverence. With this water, Nektarios of Aegina, who taught in Chios, protected himself with fervor. With this water, so many saints have been healed, and so many of the faithful have been delivered from sicknessess! Heal me also, therefore, O Champion, of the wounds of my soul and body, O wonderworker Markella, by the partaking of your water (thrice). This water springs forth from your honorable relic, and those who pray here with fervent faith are also warmed. This water has become like the Jordan on Chios. This water has been shown as the spring of Moses in Chios. This water is a divine gift from above, and a great treasure. This spring is not a mere spring of water, but a spring freely pouring forth wonders and grace, through your intercessions, O comely Markella, to Christ, to Whom belongs the dominion unto the ages. The riches of your intercessions. 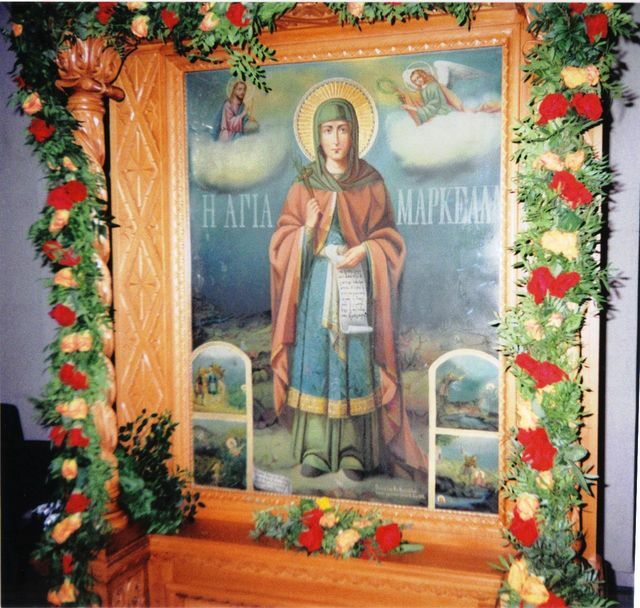 O holy martyr of Christ Markella, hearken to my prayer, as I call upon your protection in reverence. Extend your hand, O bride of the Lord, O spotless one, and entreat your sweetest Bridegroom Christ on behalf of us, seeking the fulfillment of our requests unto salvation. As a martyr, grant us progress in the faith and correction of our life. As one possessing the grace of healing, grant us healing from above. As one truly glorious in working wonders, wondrously save us from every dangerous circumstance, tribulation and want, that through you, we might hymn Christ God, He Who is, unto the ages of ages.